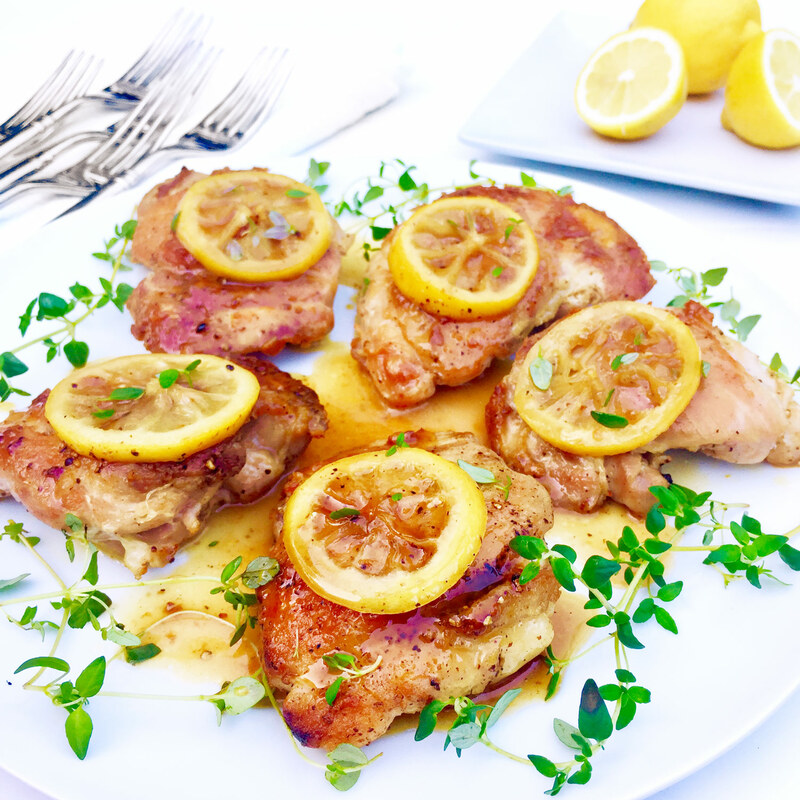 Mom used to make the lemon chicken from the Silver Palate Cookbook when we were little girls. It seemed like a massive project, as she dredged all the chicken nuggets in flour and fried them in veggie oil, which ultimately made its way into a viscous sweet-tart marinade. It was to die for. For those of you who are time-challenged, this is our quick and easy rendition of that yummy dish. It’s a healthier version, but it is still big and bold on flavor. We are pretty darn attached to the bacon fat in this recipe since we’re southern gals, (it’s not much! ), but if you just can’t bring yourself to use it, ghee or duck fat works great. Stir together the lemon juice, maple syrup, a pinch of salt and freshly ground pepper in a small bowl. Set aside. Slice the lemon rounds and remove any seeds. Rinse the chicken with water and thoroughly pat dry. Transfer to a plate and season both sides with salt and freshly ground pepper. Place the fat of choice in a large heavy skillet over high heat. When piping hot, add the chicken (skin-side down if using), reduce to medium-high heat, and cook until crispy brown, about 6-8 minutes. Turn the chicken, reduce heat to low. Cook about 3-4 minutes, or until the chicken is cooked through. Transfer chicken to a baking dish. (A small glass Pyrex works well, or a pie plate is nice for re-warming.) Add lemon mixture to the skillet along with the lemon wheels. Add 1/2 cup water and a sprinkle of salt and pepper to the lemons. Cook on medium heat for 6-8 minutes, turning the lemons a couple of times. When the sauce is thick and syrupy, reduced to a glaze, pour the mixture over the chicken. We place a lemon round or two on servings for those in the family who like it, and leave several plain for those who don’t. Serve immediately. We often use the little boneless, skinless thighs that come prepackaged at the grocery store for weeknight fare. They cook much faster than the thighs with bone and skin that ya get at specialty markets. If you’re working with bone-in thighs, keep in mind that they generally need more cooking time. Add a little more water to the pan to prevent over browning. 1. This dish can be made a couple days in advance and refrigerated. Warm it, covered, in a 350-degree oven for 15 minutes or so. You may need to add a little water when you reheat so the sauce doesn’t burn, so take a peak after about 7 or 8 minutes. 2. Ghee is clarified butter, which means that the milk solids have been removed. The milk solids are what brown easily in butter. We love using ghee, known as the good fat, for sautéing. 3. Some of our kids like their chicken plain, so for them we simply remove a couple of the chicken thighs before adding the lemon.